No other wine-producing European nation in recent years has so completely overseen the quality and origin of its wines as Austria. A reputation can be damaged very easily and quickly, and repairing it can take a lot of time and money. A couple of decades ago, thanks to a few fraudsters who, in their efforts to make their wines’ flavor finer, added antifreeze, Austrian vintners lost billions. But today this practically forgotten scandal has also had a positive impact. Nowhere else is wine quality so carefully and thoroughly monitored as it is in Austria. It’s also hard to find a country where wine quality has so markedly improved over the last 20 years. Austrian vineyards, which cover over 40,000 hectares, stretch across a strip of land that from north to south abutting the borders of the Czech Republic, Slovakia, Hungary, Slovenia, and Italy. The vineyards are divided into three regions – Lower Austria (Niederöstereich), Burgenland, and Steinmark (Styria). Lower Austria leads in terms of significance and area, though each has its own specialties. For example, the white wines from the area around Neusiedlersee in Burgenland contain high levels of residual sugar, while wines from Styria are very distinctive to the nose and palate. Austrian ice wines are in a class by themselves, and are among the finest in the world. 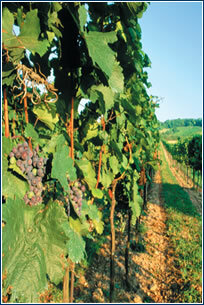 70% of Austrian vineyards are planted with white varietals. The most widespread is Green Veltline (Grüner Veltliner). Among the blue varietals, the most common is Zweigeltrebe (8% of the area), from which Austrian vintners produce remarkable red wines. This varietal was cultivated in 1922 by Dr. Zweigelt, the director of a wine-making school in Klosterneuburg by crossing Saint Laurent and Frankovka. But this varietal didn’t become popular among wine connoisseurs until the second half of the 20th century. It is semi-early, so it has a greater chance of ripening in Austria’s tougher conditions, giving vintners good material for preparing harmonious red wines with a pronounced flavor and purplish color. At first glance they seem like a set of luxury pens. 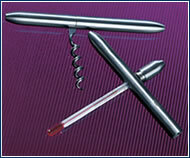 But closer examination reveals ingeniously hidden tools for wine lovers. Q-thermometer & James corkscrew by Ad Hoc. Price: CZK 855 each. Zámek PardubiceOn 29 and 30 August you can taste interesting domestic and imported wines at the 6th annual Pardubice Wine Festival in the city’s castle. An elegant full-bodied wine, classic bouquet, and a nice peppery persistence on the palate. Morillon is the local synonym for Chardonnay. The wine is nicely extractive and harmonious with marked mineral notes and a spicy lingering on the palate. This wine is made from selected, fully-ripened grapes, which is reflected both in its marked bouquet and exotic fruity notes, as well as in its long, very pleasant persistence. Out of 700 competing samples, this wine was selected as one of the 99 best, and it goes well with asparagus. It is fine on the nose and palate, and is very drinkable and non-aggressive.